Shed, tank, fence and tubing. Solar panels provide power where there otherwise would be none. John Spann puts the finishing touches on our weather station. 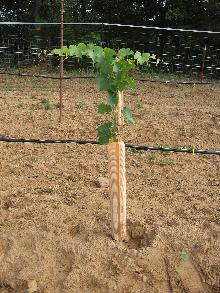 The northwest corner of the vineyard. West side is about done. Time to dig some more. 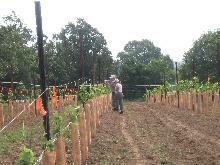 A great view of the prepped vineyard. Our guests of honor appear. A closer view of the plants. The first plant goes into the ground. The original crew hard at work. A few weeks later, greenery emerges. Some of the vines were in too much of a hurry. The vines came to life quickly. This vine is ready to be headed. A look without the growth tube. A closeup of the same vine. Lots of green above the tubes in this one. The wires provide an interesting effect. Reaching up and out--just what we need. Marvilla and John look at the early summer growth. These ratchets on the west end hold the wires tight. On the east end, only anchors are necessary. Very few issues with cows in this area. This is what we mean by vertical growth. This is what the French call "veraison". Who needs the yellow clips when you have nature's alternative? We hope to see a lot more of this. Going to sleep for the year. Autumn light through the leaves. One last view of fall.